3 Bedroom Detached House For Sale in Penzance for Asking Price £560,000. A beautiful extended 3 bedroom detached stone farm cottage with a wealth of character and charm. Set in a wonderful rural position with views over farm land and countryside. This property is a perfect hideaway and would make a lovely family home or holiday property. Arriving at the property is a delight as you first walk through the gardens. As you enter the property you step into the former kitchen which now offers a large dining are. This room has plenty of character with its beamed ceiling, timber flooring, sash window and the AGA. Moving through the property you enter into a snug again with character and a log burning fire place, this then leads you to the first of the extensions. The large and bright sitting room adds a modern twist to the property but with the beamed vaulted ceiling, under floor heating and the expanse of glass complements the property. Staying on the ground floor the second of the extensions is the fabulous designer kitchen. Again this has a modern touch but also blends in with the country style cabinets and solid wood work surfaces, central island and a range of fitted appliances complete the design. The cleaver use of lighting and windows and under floor heating add to the design. Double doors lead out to a pretty seating area ideal for morning breakfast. Part of this extension also has the utility room fitted with units, sink and washing machine. There is also under floor heating and the oil fired boiler. Another feature is a shower room fitted to a modern style with wc and with under floor heating. Arranged over the first floor are the three double bedrooms, the larger being the master bedroom which has lovely countryside views and the advantage of the en-suite. This has been crafted using reclaimed oak, glass luster tiles and modern design fittings. The spacious family bathroom has also been crafted to match with the en-suite. From the two further bedrooms you also have reaching countryside views. The pretty country gardens lay to three sides of the property with a variety of flower beds, shrubs, trees and hedging to the boundaries. There are a number of seating areas that catch the sun, from the gravelled Mediterranean are next to the kitchen, to the patio by the sitting room, plus the terrace across the front of the property. The front garden also has a very unique detached summer house with its own look out tower. There is also a further detached workshop/studio that has the potential to be an annexe subject to planning consent. 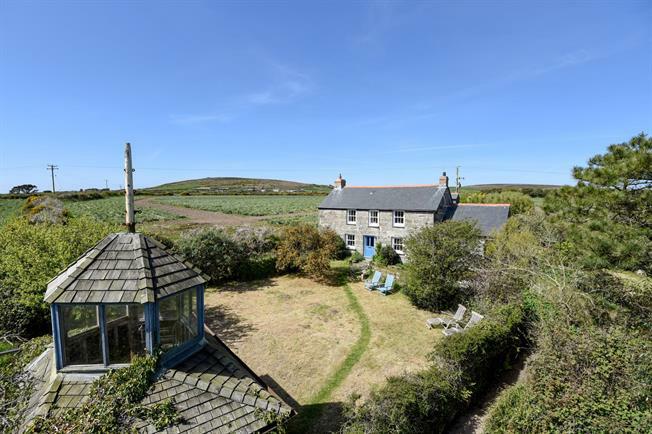 The property is situated in the beautiful Cornish countryside close to the fantastic scenery of the West Cornish coast. The area is designated as an Area of Outstanding Natural Beauty and nestles between the Atlantic coastline and the impressive hill of Chapel Carn Brea. Gwenver beach, with its excellent surfing and swimming waters is about a mile distant and the village of Sennen is approximately 2 miles away. Sennen offers local shopping facilities and restaurants and features a beautiful sandy bay which also provides excellent surfing and swimming. West Penwith has some of Cornwall's most spectacular coastline with fantastic sandy beaches, dramatic cliffs and the world famous Lands End. Nearby is the famous Minack cliff-top theatre at Porthcurno. The property has mains water and electricity. Private drainage. Oil central heating. Council Tax Band C.